IZOTE INKS are non-toxic inks made from a classic oleo-resinous copperplate varnish and natural earth pigments. They are highly pigmented inks with exceptional tonal range and density, especially well-suited to printing fine aguatints and photogravure. The inks are available in 5 colors and transparency base. Inks are listed from warm to cool. 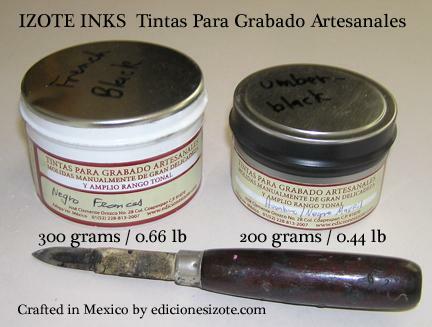 • French black, a traditional blend of frankfort and bone black pigments, is a slightly warmer, creamy dense black ink. • Vine black is a cooler, looser black ink. All the inks have exceptional tonal range and can be extended for images requiring more transparent bases. For comparison sake, a large can of 200 ml. Charbonnel weighs about 20 grams less than the 300g can of Izote.